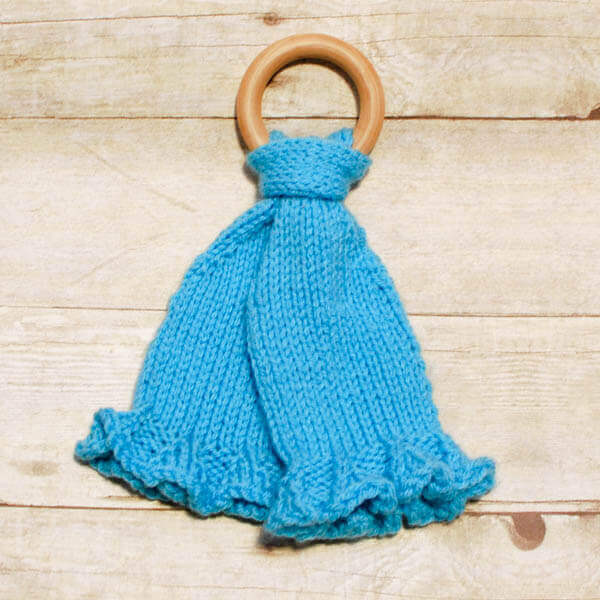 Last week I shared my crochet version of this sweet baby lovey … perfect for comforting your teething baby or giving as a gift! 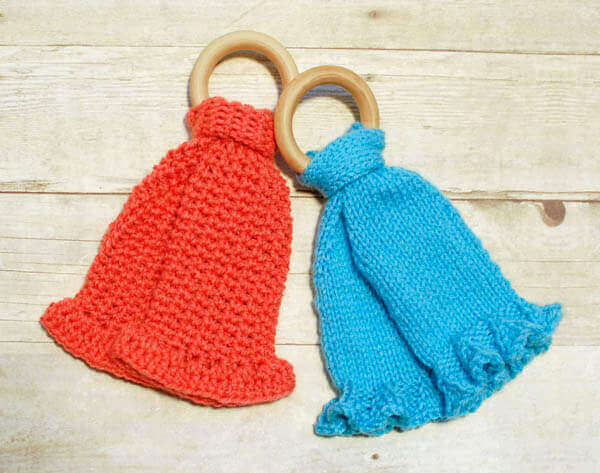 If you missed it, you can find the free Teether Lovey Crochet Pattern here. But of course I wanted to offer a lovey knit pattern for my knitting friends. I designed these lovey patterns to celebrate the release of Red Heart’s® new Baby Hugs™ yarn line, a lightweight acrylic yarn available in bright and happy colors … and best of all it’s colorfast and has been tested and certified to be safe and free from harmful levels of over 300 substances. GAUGE: 16 sts = 4”; 22 rows = 4”. Finished lovey measures approximately 10 in. [25.5 cm] from top of wooden teether to lower edge. St(s) = stitch(es); ssk = slip, slip, knit these 2 stiches together; k2tog = knit 2 stitches together; M1R = make one stitch facing right; M1L = make one stitch facing left. Cast on 63 sts. Divide evenly over double pointed needles and join to work in the round, taking care not to twist sts. Place a marker for beginning of round. Round 1: *Knit 6, purl 3, repeat from * around – 63 sts. Round 2: *Ssk, knit 2, k2tog, purl 3, repeat from * around – 49 sts. Round 3: *Knit 4, purl 3, repeat from * around – 49 sts. Round 4: *Ssk, k2tog, purl 3, repeat from * around – 35 sts. Round 5: *Knit 2, purl 3, repeat from * around – 35 sts. Round 6: *K2tog, purl 3, repeat from * around – 28 sts. Round 7: *Knit 1, purl 3, repeat from * around – 28 sts. Round 8: Knit each st around – 28 sts. Rounds 9 through 26: Repeat Round 8. Round 27: *K2tog, knit 12, repeat from * around – 26 sts. Round 28: Knit each st around – 26 sts. Round 29: *K2tog, knit 11, repeat from * around – 24 sts. Round 30: Knit each st around – 24 sts. Round 31: *K2tog, knit 10, repeat from * around – 22 sts. Round 32: Knit each st around – 22 sts. Round 33: *K2tog, knit 9, repeat from * around – 20 sts. Round 34: Knit each st around – 20 sts. Round 35: *K2tog, knit 8, repeat from * around – 18 sts. Round 36: Knit each st around – 18 sts. Round 37: *K2tog, knit 7, repeat from * around – 16 sts. Round 38: Knit each st around – 16 sts. Round 39: *K2tog, knit 6, repeat from * around – 14 sts. Round 40: *K2tog, knit 4, repeat from * around – 12 sts. Round 41: Knit each st around – 12 sts. Rounds 42 through 73: Repeat Round 41. Round 74: *M1R, knit 6, repeat from * around – 14 sts. Round 75: *M1R, knit 7, repeat from * around – 16 sts. Round 76: Knit each st around – 16 sts. Round 77: *M1R, knit 8, repeat from * around – 18 sts. Round 78: Knit each st around – 18 sts. Round 79: *M1R, knit 9, repeat from * around – 20 sts. Round 80: Knit each st around – 20 sts. Round 81: *M1R, knit 10, repeat from * around – 22 sts. Round 82: Knit each st around – 22 sts. Round 83: *M1R, knit 11, repeat from * around – 24 sts. Round 84: Knit each st around – 24 sts. Round 85: *M1R, knit 12, repeat from * around – 26 sts. Round 86: Knit each st around – 26 sts. Round 87: *M1R, knit 13, repeat from * around – 28 sts. Round 88: Knit each st around – 28 sts. Rounds 89 through 106: Repeat Round 88. Round 107: *Knit 1, purl 3, repeat from * around – 28 sts. Round 108: *Knit 1, M1R, purl 3, repeat from * around – 35 sts. Round 109: *Knit 2, purl 3, repeat from * around – 35 sts. Round 110: *M1R, knit 2, M1L, purl 3, repeat from * around – 49 sts. Round 111: *Knit 4, purl 3, repeat from * around – 49 sts. Round 112: *M1R, knit 4, M1L, purl 3, repeat from * around – 63 sts. Round 113: *Knit 6, purl 3, repeat from * around – 63 sts. Fold piece in half, lining up short ends, and insert folded end through center of wooden ring. Pull short ends through folded end and pull to tighten, securing piece around ring. Remove for washing. These are so cute. I want to try making them.